Chestnut blight canker on main stem of American chestnut (Castanea dentata); note dead branch in center of canker, discolored bark, and orange bumps (stroma). L. Haugen, USFS, Bugwood.org. Unlike other blights, chestnut blight is not just associated with shoot dieback; it can kill twigs and branches of any size. It is actually a canker disease caused by a fungus, Cryphonectria parasitica, formerly known as Endothia parasitica. The significance of chestnut blight is tied to the species it decimated- the American chestnut, Castanea dentata. In 1900 the American chestnut was not only the dominant species of eastern hardwood forests in the U.S., it was the most important tree commercially, because of its beautiful, rot resistant lumber, because of the quantities of edible nuts it produced, and because of the rapidity with which it could repopulate clear-cut areas of the forest. 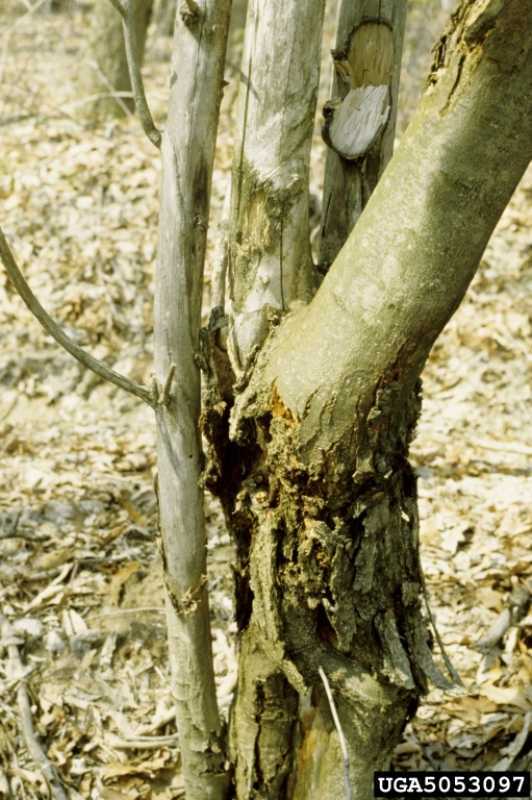 Chestnut blight was first identified in the United States in New York City in 1904, but it probably entered the country earlier, in the late 1800s on imported Asian chestnuts. By 1950, 99.9% of American chestnuts were reduced to either dead stumps or stumps with adventitious sprouts arising from the roots surrounding them. Many of these stumps persist today and are still sending up diseased sprouts that are as susceptible to chestnut canker as the parent plant. Other species that are highly susceptible to chestnut blight are the Allegheny chestnut (C. pumila), the bush chinkapin chestnut (C. alnifolia) and the European chestnut (C. sativa). The last species, Castanea sativa, is not native to the U.S. and is restricted here. Some oaks are host to the disease; these include live, post, scarlet and white oaks. It is also occasionally found on shagbark hickory, red maple and staghorn sumac. Chinese and Japanese chestnuts have shown some resistance to chestnut blight; for these Cryphonectria parasitica is a stress pathogen only. No other species of chestnut, however, has the characteristics necessary to replace the American chestnut as a forest tree or as an ornamental. The European chestnut, Castanea sativa, does share some of these characteristics, but it is also susceptible to chestnut blight and its importation into this country is restricted. Obvious symptoms on the American chestnut include flagging (the yellowing and dying of individual branches) and dead leaves that hang onto branches over the first winter. On young trees and on juvenile branches of mature trees, cankers appear as yellowish to reddish areas in the bark around branch crotches; these cankers can girdle and kill a branch within a few weeks. 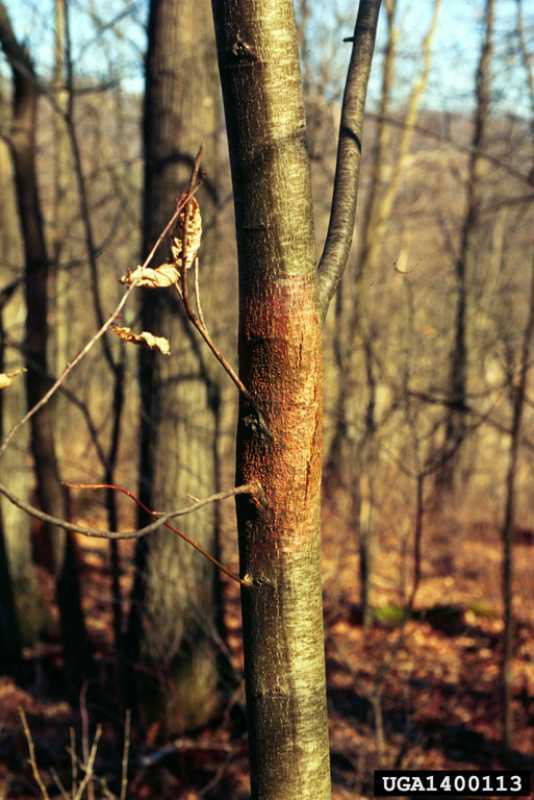 On mature trees, cankers are initially imperceptible unless the bark is stripped off. Later, as the canker expands, the bark swells and cracks, eventually falling off. 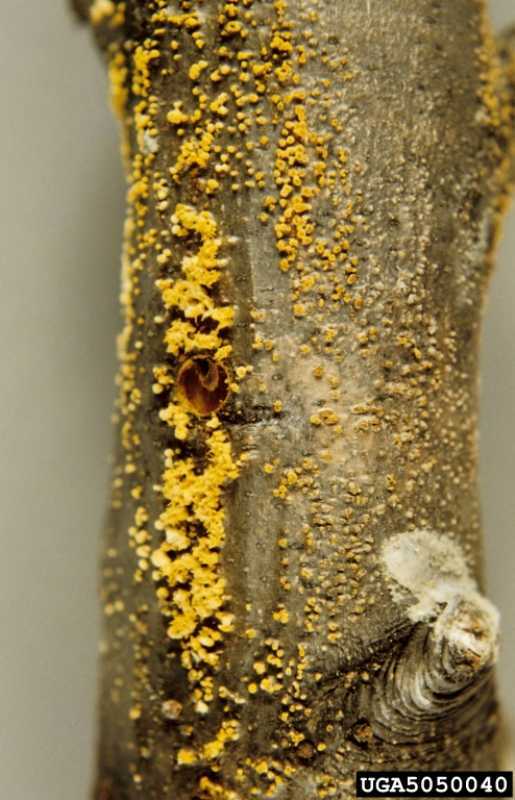 Yellowish brown fruiting bodies may be visible on the surface of the bark around the canker or in the cracks in the bark. In American chestnuts, the trunk is eventually girdled which can occur within a few weeks for young trees and within a few years for mature trees. Few last longer than four years. Suckers usually shoot up from the surrounding roots of American chestnuts providing a constant supply of susceptible tissue for the pathogen’s continued existence; this suckering does not occur in other species. Live oaks decline slowly. Foliage at the crown is chlorotic and sparse with dead branches. Cankers are difficult to discern. Severe dieback can occur on post oaks and scarlet oaks, but smaller cankers or superficial cankers are more common. Cankers on post oak are more pronounced than on live oaks and the bark will usually slough off, while on scarlet oaks the cankers appear swollen and remain covered with bark. Swelling can also indicate cankers on white oak. Infected Chinese and Japanese chestnuts are usually stressed trees. Chinese chestnuts display twig or branch dieback or targetlike cankers, and bark will eventually slough off. Buff to orangish flat, mycelial fans in the diseased bark are characteristic of chestnut blight although positive diagnosis of the disease requires a laboratory test to culture the fungal pathogen. The success of this disease must be attributed, as least in part, to its ability to spread in so many different ways. Vectors include insects, birds, other animals, wind, and rain. Ascospores or conidia enter fresh wounds, probably caused by insects, usually in bark surrounding branches and twigs. Buff to orange mycelial fans then spread into living bark and cambium tissue. As cell death occurs, the fungus spreads into living tissue. Thus, as branches and twigs are girdled, the canker moves toward living tissue–ultimately to the main trunk of the tree. It does not, however, invade the crown. The environmental conditions necessary to the survival of the chestnut blight pathogen seem virtually unlimited. No condition in which a chestnut can live discourages or suppresses the pathogen. It can live anywhere chestnuts live and can reproduce at any time of the year. 1 There is no cure for chestnut blight. Once the pathogen is present in an area, and it is already present in most areas, any American chestnut is at extreme risk; therefore, do not plant them. Other species should only be planted in preferred growing conditions; stressed sites will place them at risk. 2. Choose resistant species. Although the search for a blight resistant American chestnut has been ongoing for nearly a century, no blight resistant American chestnuts are currently on the market. Specimens sold as "blight free" have not been exposed to the disease (i.e., blight-free does not mean blight resistant). Nut growers should avoid the American chestnut. Choose hybrids of the Chinese chestnut (Castanea mollissima) instead. Recommended cultivars include: ‘Eaton’, ‘Peach’, ‘Gideon’, ‘Sleeping Giant’, ‘Qing’, ‘Au (Autumn) Homestead’; ‘Willamette’ is no longer recommended. Check with the University of Missouri Center for Agroforestry for information on growing, pruning and care of the Chinese hybrids. Strategies 1 and 2 are both strictly organic approaches.